It seems the War is in need of some new supplies. Here we see Administrator of the Office of Price Administration Leon Washington staring down the personification of the American public, John Q. Public. Created in 1942 by President Franklin D. Roosevelt, the Office of Price Administration had the authority to regulate the price of nearly all civilian goods as well as the price charged for military supplies. The Office of Price Administration was able to dictate the amount of everyday good any one person could buy. Tires were included in these goods. This caused the American public to “nurse along” the tires they did have. Anita Folsom and Burton W. Folsom. FDR Goes to War. (New York: Threshold Editions, 2011). 120. Ames Historical Society, "World War II Rationing on the U.S. Homefront," http://www.ameshistoricalsociety.org/exhibits/events/rationing.htm (accessed April 19, 2012). 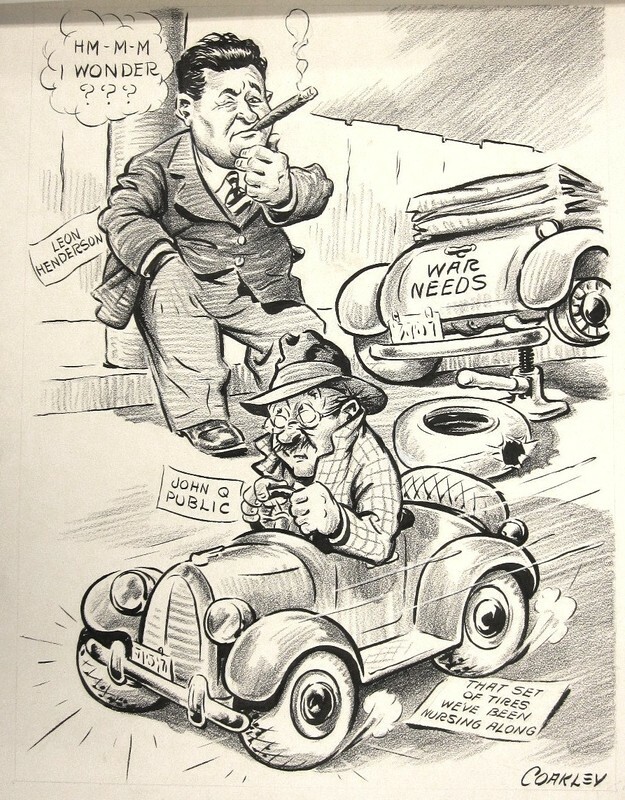 Lebaron Coakley, “War Needs,” James Monroe Museum Political Cartoons, accessed April 19, 2019, http://jmpolitoons.umwhistory.org/items/show/109.